So it's come to this: the Leatherman Fuse Multi-tool without Knife. Designed for use by students and employees restricted to non-cutting tools, the Fuse still provides a wide range of alternative tools, but no clip point blade. The good news is that the Fuse is otherwise the same high quality Leatherman multi-tool with an improved blade locking system. Every blade locks into place for safe and secure use -- fifty percent stronger than the old locking mechanism. Blades open one at a time as well, so pulling one free of the handle does not pull out a rat's nest of options. You actually can select the one you need and get at it. Like the more venerable Swiss Army knife, the serviceability of the individual blades can be marginal -- the scissors for example won't be much good for anything but trimming thread, and the can opener isn't likely to solve any emergencies in these days of pop-top containers. The tool does include a selection of things you'll actually need, like screwdriver bits and a decent pair of long-jaw pliers. Pliers really are the heart of this tool, with everything else only a built-in emergency accessory. 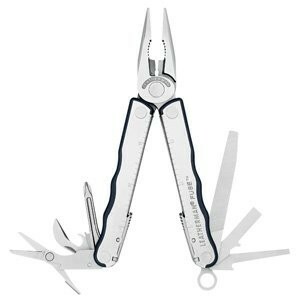 One of the best things about Leatherman multi-tools is that the pliers themselves are rugged. While not so bulletproof as a stand-alone pair, the Leatherman Fuse will get you by when a cheaper knock-off multi-tool only distorts into a useless mess. Where pocket knives are still allowed, carry a pocket knife and the Leatherman Fuse. The Leatherman clip point blade was awkward anyway.